The artistic pattern on these return address labels is so subtle and intricate - you may have missed it. Look again and you'll see an elegant motif created using a method of drawing known as stippling. The tiny points were placed by the artist to create graceful waves on a beautiful background featuring a citrusy shade of orange. But the look of your outgoing mail isn't the only thing that will improve. You'll be impressed by how much easier it is to fill out envelopes. That's because these are self-adhesive labels. Just stick them in place and move on with your day! 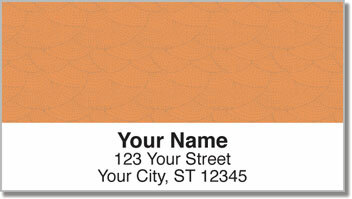 Get your own Orange Stipple Address Labels right now! Three other color options are available, or if you prefer variety, choose the set with all four styles.